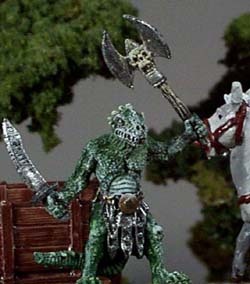 Lazinar are a race of intelligent Lizards, tall, powerful, and covered with a gray-green leathery flesh. They have long powerful tails, which give them great balance. They are primarily a desert dweller and are not all that familiar with water. They are natural born warriors with sharp claws and vicious teeth for biting. The Lazinar have adapted to live in hot dry climates. As such they are very resistant to heat but very susceptible to cold. The Lazinar are cold–blooded meaning they will slow down as their body temperature decreases. The Lazinar grows to six and seven half feet tall and will normally weigh between 250 and 300 pounds. The Lazinar character starts out with the Balance Skill and Conserve Energy Skill at level 8+0. In addition, these skills are easier for the Lazinar to learn. The Dice figure for these skills goes from Regular 1 to Easy 2 for the Lazinar. The Lazinar finds the following skills harder to learn; Climbing, Concealment, Disguise, Locksmith, Move Un–noticed, Reduce Fall, Sleight of Hand and Winter Craft. The Dice figure associated with these skills goes from Regular 1 to Hard 2 for the Lazinar. The Lazinar takes half the normal damage from exposure in desert climates. When hit by a Fire-based damage spell the Lazinar's Wound Resistance roll is doubled (only his personal roll is doubled). The Lazinar takes double the normal exposure damage when in cold climates. If the Lazinar takes any damage from a cold–based spell or effect, then he/she will be slowed for the following round. This means that the Lazinar must double all his attack speed dice rolls. If he rolls over half on the dice, then he does not make that attack (i.e., his natural attack has an attack rank of 24/2d12. He rolls the 2d12 and doubles it. If the final figure is greater than 24 then the Lazinar does not get the attack on that combat round). Each individual cold–based spell will slow him for one combat round unless he gets himself stuck in an area or spell affect that continually damages him from round to round. He must actually suffer cold–based damage in one round to be slowed in the following round. The Lazinar's Natural attack is taken in addition to one single–handed weapon attack (giving the character 2 attacks per combat round if not using a shield). Thus, if the Lazinar wields a long sword, it will attack with the long sword plus with its own natural attack(s). Even though the Lazinar has a bite and claw attack it only gets a single combined attack roll for all of its natural attacks. The Lazinar's natural attacks have the following characteristics. Please note that the TKA for the Lazinar does not include his own To Kill Adjustment (TKA). This means that the total normal damage for its natural attack will be 1d8+1d6.